This entry was posted in Architectural History, Heritage at Risk, Kildare and tagged Architectural History, Ballitore, County Kildare, Georgian Architecture, Heritage at Risk. Extraordinarily bizarre! outrageous decision-making here. Shame on KCC and Glambia for their actions. It is bizarre really; and the pictures make that point particularly clear. Thank you for your interest. How sad for a billion dollar corporation to destroy history like that, but no surprise eh. Makes no sense to me- why build that huge ugly structure around it and THEN tear it down? 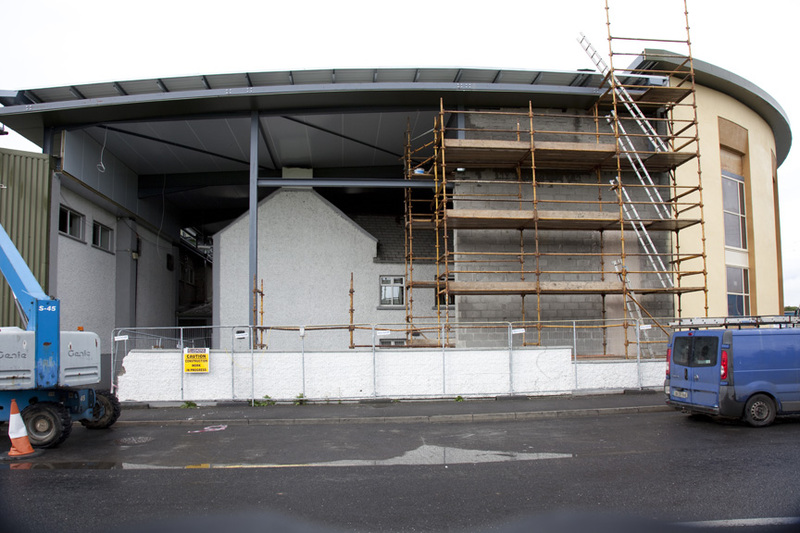 No sense to me either, the process seems strange, unless Glanbia was continuing to use the ‘two storey office building’ until the last minute? Cheese group they may be but putting up a building that looks like a huge cheese takes the biscuit! That is certainly one of the more bizarre things I have seen! Yes, it would so thank you for not doing so! It’s sadly indicative of the planning process in Ireland, but, alas, taking a ‘them’ and ‘us’ approach (to what can be seen in the pic as a denigration on top of a pebble-dashed insult), is unlikely to help matters. Thank you for your comment. I’m not quite sure what you mean by taking a ‘them’ and ‘us’ approach? If one expresses a different opinion on any subject, would you regard that as being an instance of ‘them’ and ‘us’? Surely one can register a contrarian view? Hello, I liked the comment ‘this is not Soviet Russia and tourists do not come here to look at factories’. The problem here, I feel, is once an area becomes brown field, any form of aesthetics goes out the window or, as in this case, is swallowed up. Thanks for your observation. Yes, that has often been the case in the past – but we shouldn’t accordingly resign ourselves to it remaining so into the future. Many thanks, good to have your approbation. Well done, and this is not an oxymoron. Here you really touched the essential question of any aesthete but I’am afraid it is too big a topic for your blog or any blog for that matter. Just today they opened the new ‘Waldschloesschen Bruecke’ in Dreseden, for which Dresden lost it’s status as ‘Weltkulturerbe’. Did they bother, only because a ‘Canaletto’ view of the ‘Elbe’ valley was altered? Do we have to freeze historic arrangements to please modern aesthetes? In Germany they find one historical rotten stone in the ground and rebuild a whole ‘Kaiserpfalz’ on top of it, in Pompeii they have a whole historical important town but not the money to keep it up. Here in Ireland we recently saved a lot of important buildings but it transpires now that it was done in a lot of cases only with borrowed money for which every body of us has now to pay dearly (besides other things of course as well). Do you have really any answers to this? This is quite ironic to me as I am about to depart for Donegal next week to photograph the Architectural Heritage of that County, courtesy of the NIAH. One arm of government represented by KCC (Kildare County Council) is seeking to destroy our heritage and another the NIAH (National Inventory of Architectural Heritage) is trying to document and help preserve it. I suppose the GAA badge wearing bureaucrats of KCC are blind to the fact that there is more than one source to Irishness, whether that is our people, culture or heritage. I bet if a founding member of that organisation (GAA) had lived in the house it would be a different matter, And I don’t care how un-PC my statement is!!!!. Thank you for your comment. It is certainly true that very often in this country different branches of government do not liaise with each other and so policies are often pursued in conflict with each other. A more coherent approach is required, especially in relation to heritage, and really ought not to be difficult given this is not a very large island. However, that would require the political drive which sadly remains absent. Super post Robert. I’d already seen James’ striking picture in another context. (I think Turtle B posted it on his Whistorical page earlier) but its very interesting to get all the background here, so expertly covered. Hideous affair really. It would be bad enough as a freak, isolate, one-off case, but as part of an overall pattern, just dismally, deeply depressing. Have to say, I thought we had leaned and had moved on from this sort of thing. Thanks for your comment. The problem is that this building was judged in isolation and not in context, and therefore found to possess little merit. Furthermore, no thought appears to have been given to the effect an immense new structure would have on the local environment, completely disrupting the scale of the long-established settlement. It is this kind of intelligent, joined-up thinking which is often displayed in planning matters. Congratulations, as you can see from numerous replies you have struck quite a nerve with this topic. The good thing about the Glanbia structure is that one day it will as easily come down as it is now coming up. As to the structure within, in my eyes it is as boring as the new one, 18th century or not. Of course I believe you when you point to the fact that the Quaker house is important within the wider context. But here you are opening an endless field. Look at Powerscourt, a huge block of a hotel, discrete though, golf course, shopping units all over but they generating money to even reconstruct the old ballroom. In my eyes the new bridge across the Boyne does hugely enhance the looks out of the Oldbridge estate. When Glanbia would have asked me as a milk supplier to deduct some money from my milk cheque for the extra costs when they would employ Norman Foster to construct a new office facility I would have kicked…. Just these days the city of Dresden let laps the title of ‘world heritage site’ because they built a new bridge across the Elbe and thus altering the ‘Canaletto view’ of the 18th century. The only objection I would have here is that they didn’t employ Calatrava. In the end it always comes down to money, who is paying how much for what. For every case of cultural vandalism there is a case of a do-gooder’s insanely spending. Look at the financial saga behind Oldbridge and Farmleigh for example. The art is to struck an equilibrium between aesthetic and function. Thank you for your very intelligent and informative comments. I would not argue that the house which has now been demolished was of enormous architectural importance in its own right. Its significance lay instead in being part of a greater whole. If buildings in an urban setting are judged solely on their inherent merits and not on their place within the setting, then very few will be deemed worthy of preservation. When the Electricity Supply Board wished to demolish a terrace of Georgian houses in central Dublin in the early 1960s it prevailed on Sir John Summerson to pronounce that the buildings were each of no great architectural importance. In saying this he was both right and wrong, because he judged them in isolation and not as part of a long-established urban setting (including being the longest uninterrupted run of Georgian houses) in which the disruption of any part would have negative consequences for the whole. The demolition of that terrace had precisely this effect, and so is also the case at Ballitore: any intervention, especially on this scale, has an immediate impact on the rest of the village. Oh, and one further point: of course you are absolutely right about Powerscourt, County Wicklow which is a travesty, its long-established demesne entirely spoilt by ill-considered interventions in the landscape (while the house, contrary to any claims otherwise, has not been ‘restored’). And I would also entirely agree with you about Farmleigh (and, I might add, the ruination of Carton). Thank you again. For a long time, archaeological sites were looked at individually and not in their context. This approach has generally been replaced by looking at monuments in their landscape setting and relation to other sites if they exist. It’s a pity the planning authorities are not taking this approach too in order to preserve the cultural heritage. It is however encouraging that this post received so many comments. Another fit of insanity by the blind, brutish lustcoins. What silvered treasure will be next thrown into the corporate crucible for taking it as tin? I spent an hour or two amazed at how much precious heritage is trashed for lack of understanding. I have enjoyed this blog greatly. Thank you for your comment. Please come back regularly and do spread the word: The Irish Aesthete always welcomes new visitors. Thanks for your comments all ! This building is now half taken down – and as pointed out in the greater context of the village and as it is at the entrance to Balitore – it is of utmost aesthetic importance to the character of Ballitore – more importantly why list a building when it can be delisted when a corporate giant needs it removed – or in this case did not actually – just pure ignorance on behalf of various bodies who are meant to be watching over our heritage. They have a huge site at Ballitore and therefore could have put their new computer offices that will mean they can layoff staff ( which is happening ) further back from the road and entrance to Ballitore, hence leaving a relatively intact most important Quaker village. And the other point here is that when planning permission is requested us public rarely hear about it – as in this case – not one person i know living in the vicinity of Ballitore. Such a shame it is to our planners and highlights their brutal ignorance. Thanks to you James for high-lighting this instance of corporate and official philistinism. One had hoped a better understanding of our built heritage now existed but what has taken place lately in Ballitore sadly suggests otherwise. Vigilance is the key to ensure this sort of thing does not happen again. This house had more than a ‘general’ connection to the village. I believe it was built by Richard Shackleton, friend of Edmund Burke, father of Mary Leadbeater, and head of the Ballitore School. Its loss is a serious one. Thank you for that information. If only the house’s historical associations had been better known, and appreciated, by the relevant authorities such as the local council, then perhaps it might have been spared demolition. Certainly its replacement will never have such a distinguished history. 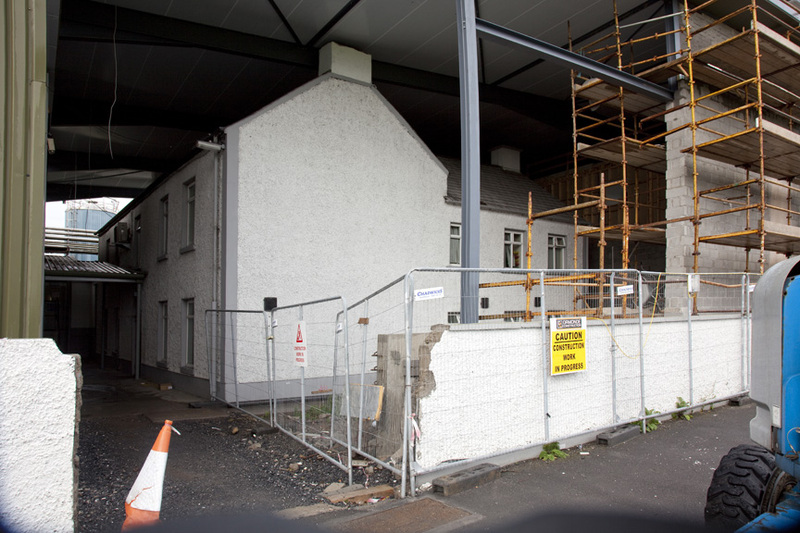 ‘We reap what we sow’ Initially there were many objections when the creamery co-op in Ballytore ignored the public right of way of the Mass path, and blocked of the path, in spite of the objections of residents, What is the point of having a ‘Heritage Office’ in County Councils?!! !